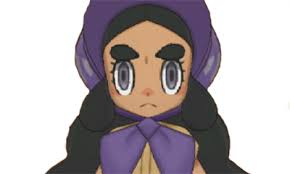 Of all the Island Kahunas, Hapu is sure to give players the most trouble. Not only are all her Pokemon above Level 50, but three of the four Pokemon have dual typing that are sure to make them all the more difficult to defeat. If you're looking for one Pokemon that could possible defeat all four of her Pokemon, that Pokemon would have to be Alolan Exeggutor, the same you can catch on Exeggutor Island well before your final Grand Trial. Alolan Exeggutor has the Grass Type Attacks that deal heavy blows to Hapu's Golurk, Gastrodon and Mudsdale, but it also has the Dragon Type Moves that can seriously hurt Flygon as well. However, if it doesn't have the proper leveling, Exeggtuor can still get crushed by Hapu's strong Ground Type Pokemon. That's why it is also a good move to have at least one Water Type Pokemon on your team, as well as plenty of Recovery Items when facing Kahuna Hapu. Outside of Gastrodon and Flygon, Hapu's other Pokemon can't withstand much from Water Types. Water Type Pokemon can usually also learn Ice Type Attacks, which tend to destroy Flygon with just one hit.